Product placement is almost as old as the film itself. First product placements were recognised in the 1920s, although many sources note that product placement had really started in 1945. In the movie Mildred Pierce lead actress Joan Crawford drinks whisky, but not just any whisky – it’s Jack Daniels. In those times producers were mostly buying or borrowing products that they used in the scenes. But the real product placement was not far away. Some reports suggest that Jack Daniels supplied the cast with free bottles of whisky and other gifts, but if you watch that particular scene more closely, you could spot a whisky but spotting Jack Daniels’ label is virtually impossible. There is also no traditional Jack Daniels square bottle. usage – characer is using the product or in some other way interacts with the product, brand or service. In case of Mildred Pierce there is usage of the brand and some sort of visual placement. In the last 60 years there has been countless examples of using whisky as a product placement. Let’s look at some of the most interesing ones. Charlie Wilson’s War (2007) is a drama based on a true story of U.S. democrat congressman Charlie Wilson, who tried to assist Afganistan rebels in their war with the Soviet Union. Wilson was known for his notorious personal life, particularly drinking. 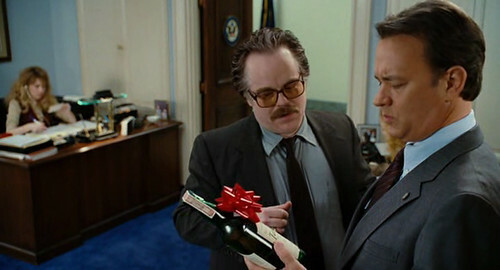 When Charlie Wilson first meets his colleague CIA operative Gust Avrakotos, he receives a bottle of whisky that would be included in another scene later in the movie. Gust: We want to give you this ’cause we know you like single malt. It’s called Talisker, and it’s mentioned in a Robert Louis Stevenson poem, The Scotsman’s Return from Abroad. Woody Allen once said: “Eighty percent of success is showing up.” Is that enough for an effective product placement or should there be something else. Above we could see that the most efficient product placement has to be integrated in the scene, because the mere presence in just not enough. Engaged viewer follows the script, acting and scene itself, so it is virtually impossible to spot some product or logo, even though some products receive significant screen time. 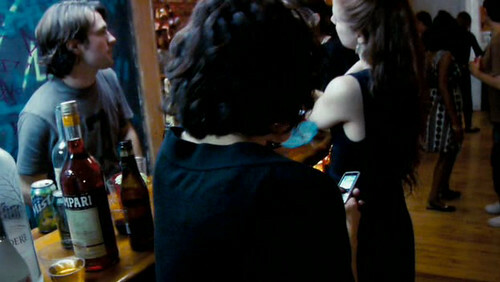 In the beginning of the movie Cloverfield there is a farewell party for the two lead characters Rob and Beth. One of their friends is filming testimonials for Rob and when he’s flirting one of the guests at the party we can see a bottle of Campari. There are many alcoholic drinks at the table (there’s a party after all) and Campari could technically qualify as a product placement. However it’s not really effective placement and Campari has no connection to the plot or with the characters. Producers could use any brand they want and no-one would see the difference. Off to a great start. Keep it up! Very interesting opening topic. Hope to see a case study of soft beverages, especially Coca-Cola, in the near future.